Just got back to Seattle from the Shuttlebirds tatting conference in Spokane followed by Camp Wannatat in Montana. Both were awesome. Five days of teaching, learning and talking tatting with some really fantastic tatters. Once I get caught up on work-work and school-work I’ll do a series of posts about both the Shuttlebirds conference and Camp Wannatat. So much to talk about for both! Plus, I still haven’t blogged about visiting the Lace Museum in Sunnyvale or Lacis in Berkeley on the way up! I want to at least put up this picture that Gina Butler took for me in Montana. If I’m going to tat all day the bandage (athletic tape) around my middle finger is a necessity to avoid having the thread create a groove in my finger and break the skin. The one around the pinky is there for the same reason and if I do a lot of tatting for more than a day or so I need it too. The one around the index finger of my right hand is a new one. I’ve never needed it before, but one of our projects at Camp Wannatat had HUGE rings. The largest was 84 stitches and while trying to pull one closed I manage to make the thread slice through the skin and draw blood. It was like a really big papercut right on the side of the knuckle. Did that stop me from tatting for the rest of the day? Of course not. I bandaged it up and soldiered on. I wasn’t about to let it keep me from soaking up as much as I could of the opportunity I had to learn from the fantastic tatters teaching at Camp Wannatat. Whew. Finished with 4 out of 5 of the handouts for all the classes I’ll be teaching at Shuttlebirds this year. Actually I finished them on Sunday, but haven’t really had a chance to post here about it until now. I got in to Seattle last night and I’m staying here with friends until Thursday when I head out to Spokane. The next two days I’ll be sitting here in my friends’ apartment while they’re at work trying to get all caught up and a head on my work for the radio station and my class work so that once I head out to Spokane I can relax and think about nothing but tatting for a few days. I still have one more class to prepare my handout for, the Blocking, Starching and Care of tatting so tomorrow night I’ll be meeting up with another friend here for a starching party while I write up everything. If anyone has last minute tips, I’d love to hear them! 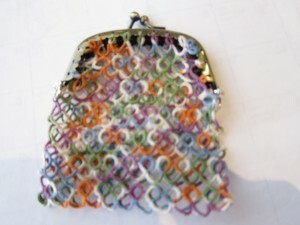 The coin purse shown here is the second of my two sample ones. This is the one that is going to end up living in my purse from now on. It’ll replace my not-very pretty proof-of-concept one that I made a long time ago. In fact, I may even cut that one up so that I can use the clasp again and make a new one out of it. In other news, yesterday I bought the fabric for the inside of the star doily. When I got to the store I realized that a fat quarter of fabric was almost the perfect size so I picked out one of those and now just need to figure out how exactly I want to attach it. Also realized (long after I left the store of course) that I don’t have any sewing needles with me and that using the same thread I made the doily with to do the sewing might not work because it’s size 10 thread. So I guess another trip to a fabric store is in line for the next couple days. I’d hoped to have it done and ready to show at the workshop on Friday, but that might not actually happen. As much as I’m looking forward to the Shuttlebirds Workshop and Camp Wannatat in Montana after it I’m also really looking forward to getting back to working on the Priscilla project. Spent a few minutes flipping through the books again last night and have quite the list of things I want to get started on. Watch this space for some new patterns! One of my main focuses lately has been in writing up the directions for the coin purse pattern that I’ll be teaching at Shuttlebirds. I haven’t gotten to creating the diagrams or adding the pictures yet, but the written instructions have just made it to the 9th page! I think I’m done with all the written portion though so I suspect the final project will be 10 pages or so. Luckily for my students, it’s not actually that hard of a pattern, but I’ve included instructions for a couple different options. Also, I’ve had to create directions for two different ways of attaching it to the clasp because some of the clasps have 14 holes and some have 15 and some have 14 on one side and 15 on the other. So yeah. That complicates the directions. Also, I’ve included option for those who want to use split chains and rings and those who don’t. I still need to make up the diagrams, but then I’m done. I realized about half-way through tatting the example above that it was probably a bad idea to use such a colorful variegate to show the pattern so I’m making another sample that’s solid purple on the top and black on the bottom. I think when I’m all done that’s going to become the one I carry around in my purse. It’ll replace the oddly misshapen, proof-of-concept version that I’ve been using the last couple months. In other news, I’m definitely coming down with a cold which is unfortunate. Hopefully it doesn’t get any worse, but if it does it’s going to make it hard to concentrate on anything for the next couple days. The finished doily sans center fabric. 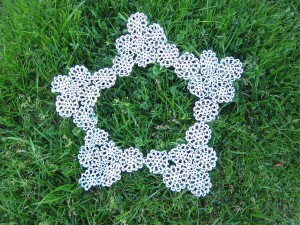 I’ve finished the tatting portion of the star doily from the 3rd Priscilla Tatting Book. Unfortunately, it took longer than it should have because not once, but twice I managed to connect the pieces wrong. You think I would have learned after the first time, but no. I misunderstood the mistake I made so I made it again. The standard rule in tatting is to “check twice, close once” with regards to making rings. Another should be “check twice, join once” with regards to putting together medallions and motifs. As I mentioned in an earlier post about the doily I was piecing it together by creating the “points” of the star first and then tatting the medallions between them to connect them all at once. It’s a nice way to do it for this doily because it means that you avoid having to deal with a really large piece of tatting until you’re near the end. Problem is that I managed to “flip” one of the points of the star while joining so it pointed inward. Didn’t figure out what I’d done until I did it again and so I had to cut the last row of both the joining medallions. Luckily I could get away with only cutting out the last (chains-only) row and one of the rings from the previous row. So the actual fixing wasn’t too difficult or take too long. Though I still put it aside until just this last week because I wanted to be focused while doing it to make sure I didn’t make the same mistake again. Lately all my “focused” tatting time (meaning tatting that I actually have to pay attention to while I’m doing) has been spent on working on stuff for the classes I’m teaching at the Shuttlebirds Workshop in Spokane. That’s it for now. I’ve been sitting here at Starbucks for the last few hours reading my “Governmental and Nonprofit Accounting” textbook and getting started on my homework for my new class. First class is tomorrow night and I want to start off ahead because I’ve got so much going on in the next couple weeks. Classes are only 4 weeks long so there NO way to get caught-up if you get behind. Tired of the smell of coffee (which I don’t drink) and it’s time to get out of here.